Directories, whether online or the print version, serve a similar function. They exist to provide people with an organized list of names and business names including their contact details to make it easy to find persons or organizations they’re looking for. Online, however, directories are of different types. They can be about businesses, articles or blogs. They are as important as the print version particularly when it comes to increasing exposure of one’s business and offerings. Private individuals and organizations that manage blogs should definitely consider submitting their site including a short description, anchor text and keywords to blog directories. Eatonweb is the oldest blog directory on the web and as such, it is the right place to build your blog’s online authority. Until today, the site continues to receive submissions from various locations worldwide. It is a major advantage to be listed in a blog directory because of the many benefits to be gained. If you want your blog to attract more followers, submitting it to a directory is an ideal move. People searching for businesses and blogs online, particularly the busy ones, normally want to save time and prefer to look in a directory. If your blog is listed, there’s a greater chance it will be seen by more people. It follows as well that when your blog gets greater exposure such as in a directory, people will be more aware of its existence. This helps greatly in promoting your brand to a wider audience and keeping it on top of their minds. Blogs listed on directories have a higher chance of being indexed by search engines. 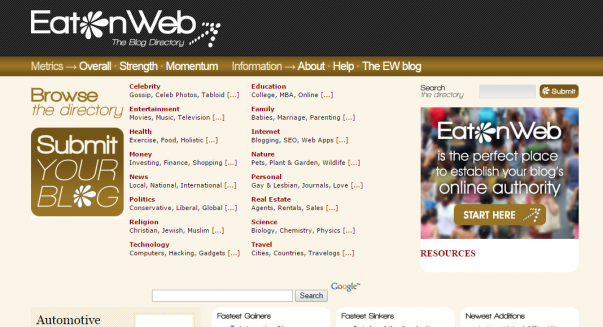 On Eatonweb, blogs are ranked according to three types of metrics – strength, momentum and overall. The strength component takes into account the individual web metrics gathered from different sources. The momentum aspect refers to the growth of a blog whether it’s healthy or weak while the overall metric measures the conjunction of strength and momentum. What this means is that when blogs are shown on the top of each metrics page on the Eatonweb site, they have a high ranking. When submitting to directories such as Eatonweb, do remember to include your blog UL, its RSS feed, a short description and tags. This way, you can be sure to gain incoming links and traffic to your site. Keep in mind that it’s not enough to update your blog on a regular basis. Submitting it to directories is also very helpful in getting more exposure.